DENVER -- Overcoming an unspecified glitch, the SkyTerra 1 wireless communications satellite has deployed a broad L-band antenna to relay mobile phone calls across North America. Boeing Co. announced the deployment Tuesday in a statement, but the company did not release any details of the problem that delayed the work. "All deployment indicators are nominal," Boeing said, adding the company will continue testing the satellite over the next several months before handing over control of the spacecraft to LightSquared. SkyTerra 1 launched Nov. 14 on a Proton rocket from the Baikonur Cosmodrome in Kazakhstan. LightSquared is a Virginia-based firm planning a fourth-generation, or 4G, wireless system designed to reach nearly every American by 2016. SkyTerra 1's 72-foot-diameter L-band reflector was built by Harris Corp. and is the largest commercial antenna reflector ever flown in space. Without disclosing the cause of deployment anomaly, a Boeing official lauded engineering teams that labored over the last few weeks to devise a fix for the antenna mishap. 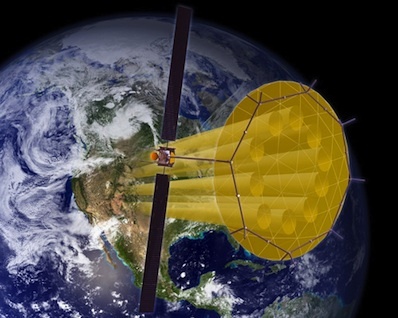 "We assembled a core team of experts, and today's success is one that we share with Harris Corporation, the supplier of the antenna, and with our customer, LightSquared," said Craig Cooning, vice president and general manager of Boeing Space and Intelligence Systems. "Although the occasional delay in a full deployment sometimes occurs on a satellite, it is not a situation we face very often. Today's success is due to the talented men and women at Boeing and their unparalleled expertise in operating satellites and in creatively and successfully resolving the issue." Martin Harriman, LightSquared's executive vice president of ecosystem development and satellite business, said the issue is not affecting the company's plans to begin service. "We congratulate the Boeing, Harris and LightSquared teams who have worked diligently over the past week to successfully deploy the SkyTerra 1 L-band reflector," Harriman said in a statement. "We look forward to Boeing's completion of in-orbit testing of the SkyTerra 1 satellite and handing over this Space Based Network to us in early 2011. LightSquared is proceeding on schedule with its roll-out of the nation's first integrated wireless broadband and satellite network." SkyTerra 1 is based on the Boeing 702 high-powered satellite bus. Boeing is preparing the SkyTerra 2 spacecraft for launch in 2011. LightSquared is marketing its unique business model, which combines terrestrial and space-based networks, as a public service for emergency responders and rural citizens.